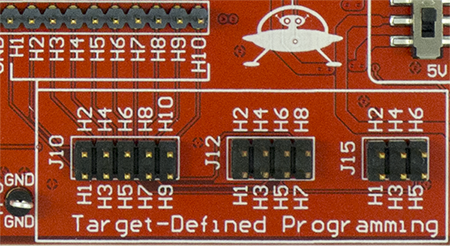 The CW308 UFO Board is a convenient main-board for attacking all sorts of embedded targets. Released in 2016, it forms the basis for most of our upcoming target boards. 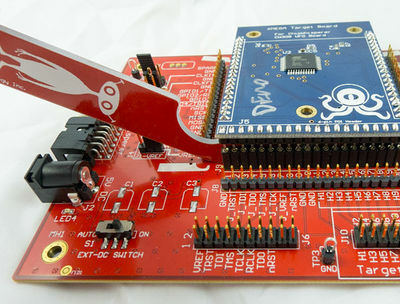 It can be used stand-alone (with an oscilloscope) or with ChipWhisperer-Capture hardware. 8.3 J14: Filter input selection. Details of the targets are held on their own wiki page. Some targets are available premade, but all have gerber files in the GIT repo so you can build them yourself. If you need to support a new target, it's generally very simple to build a custom board. The "victim board" fits into three 20-pin female headers. They provide both electrical and mechanical connections for the board. There is optional mounting holes which can be used if additional mechanical support is required (especially if you need a locked-down victim for use with an EM probe). 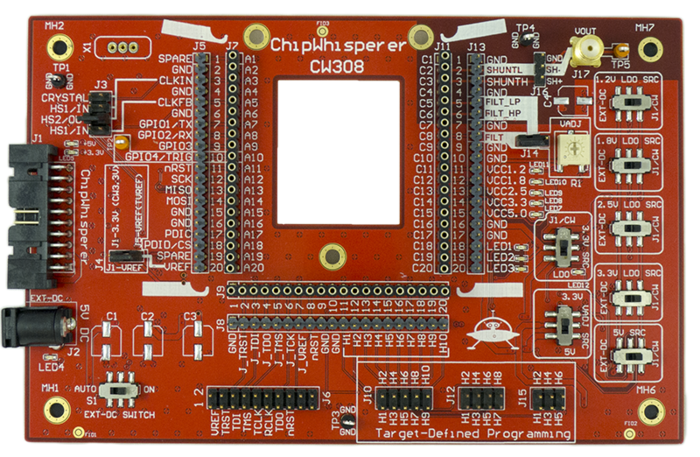 The CW308 victim board has contacts on a 100 mil spacing, allowing you to use regular prototype boards. Click for full size. Note the middle mounting hole is slightly offset to one direction! This was done to keep the mounting hole on a 100-mil grid spacing. 1 Spare Not connected to main-board, can be used as spare I/O pin breakout. 3 CLK-IN CW308 --> Victim Clock to victim. 11 nRST CW308 --> Victim 100k pull-up to VREF. 20 VREF CW308 <-- Victim Reference voltage for I/O. MUST be set to VCC-IO voltage (3.3V, etc) or I/O lines may not work. 2 JTAG_TRST Connects to 20-pin ARM JTAG header. 3 JTAG_TDI Connects to 20-pin ARM JTAG header. 4 JTAG_TDO Connects to 20-pin ARM JTAG header. 5 JTAG_TMS Connects to 20-pin ARM JTAG header. 6 JTAG_TCK Connects to 20-pin ARM JTAG header. 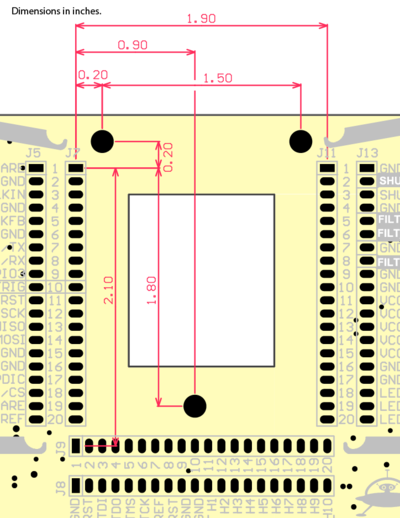 7 JTAG_VREF Connects to 20-pin ARM JTAG header. All JTAG_ pins have 100k pull-up to this pin. Must set to appropriate value. 8 JTAG_nRST Connects to 20-pin ARM JTAG header. 8 FILTIN CW308 <-- Victim Input to power supply filter. 18 LED1 CW308 <-- Victim Active-high buffered LED driver. 100k pull-down. 19 LED2 CW308 <-- Victim Active-high buffered LED driver. 100k pull-down. 20 LED3 CW308 <-- Victim Active-high buffered LED driver. 100k pull-down. The alignment should be carefully checked if resistance is found. You may need to adjust how the board is aligned, as you should be able to press down with minimal force. The CW308 should be turned off when swapping victim boards. 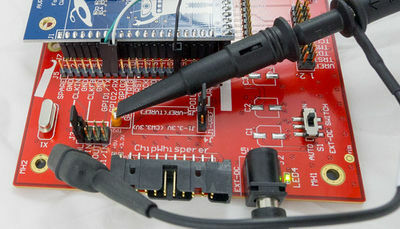 There are two main I/O connection points: the pin headers which duplicate the target board connections, and the 20-pin ChipWhisperer header. The ChipWhisperer header pins (most of the pins on header J5) have diode protection to set a maximum voltage level. The maximum voltage is set by the voltage present on the middle pin of J4. The on-board 'VREF' network sets the reference voltage to allow usage with multiple I/O levels. Note there are no voltage translators on-board, instead you can use the [CW506 Advanced Breakout Board] to provide voltage translation. One of the pins on the 20-pin connector outputs the reference voltage (VREF), so the CW506 knows what voltage level to translate I/O signals to. The on-board crystal oscillator is powered from the VREF network, ensuring the on-board oscillator is at an appropriate voltage reference. The I/O pins connected to the 20-pin header have diode clamping, with the maximum level set by the VREF network. You must ensure jumper J4 sets a correct reference level. If using any of the official victim boards this is done by setting J4 to receive it's reference level from "J5-VREF" pin. If you do NOT set a correct VREF level, the diode clamps will pull I/O pins down to invalid levels. 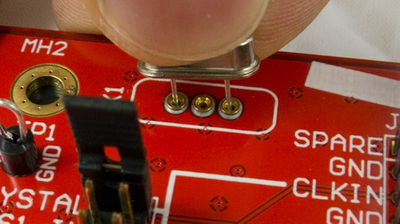 If you are using the prototyping board be sure to connect pin A20 (the 'VREF' pin) on the victim connector strip to the desired I/O level! 1 +5V I +5V from ChipWhisperer-Capture. 2 GND I System GND. 3 +3.3V I +3.3V from ChipWhisperer-Capture. 4 HS1 O High Speed output (normally clock in to ChipWhisperer-Capture). 5 nRST I/O Target RESET Pin (AVR Programmer). 6 HS2 I High Speed input (normally clock or glitch out from ChipWhisperer-Capture). 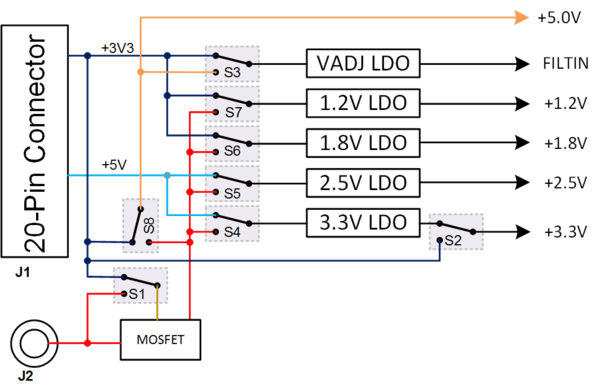 7 MISO I/O SPI input: MISO (for SPI + AVR Programmer). 8 VTarget O Set I/O voltage reference level. 9 MOSI I/O SPI output: MOSI (for SPI + AVR Programmer). 10 TARG1 I/O TargetIO Pin 1 - Usually UART TX or RX. 11 SCK I/O SPI output: SCK (for SPI + AVR Programmer). 12 GPIO2 I/O TargetIO Pin 2 - Usually UART RX or TX. 13 PROG-PDIC I/O PDI Programming Clock (XMEGA Programmer), or CS pin (SPI). 14 GPIO3 I/O TargetIO Pin 3 - Extra I/O. 15 PROG-PDID I/O PDI Programming Data (XMEGA Programmer). 16 GPIO4 I/O TargetIO Pin 4 - Usually trigger output. 18 +3.3V O +3.3V from ChipWhisperer-Capture. 20 +5V O +5V from ChipWhisperer-Capture. The CW308 contains a crystal oscillator driver. 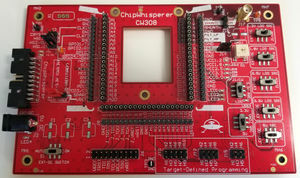 This allows you to use a standard crystal to drive either the victim board or the connected ChipWhisperer. This also allows the use of the CW308 stand-alone, as it's possible to generate almost any frequency by simply putting an appropriate crystal into the socket. Routing crystal oscillator (X1) to victim CLKIN. Routing crystal oscillator (X1) to ChipWhisperer HS-IN, then routing HS-OUT to victim CLKIN (for glitch insertion). Routing CLKFB from victim to ChipWhisperer HS-IN. Routing ChipWhisperer HS-OUT to victim CLKIN. S1 Switch 5.0V from DC-Power Jack On/Off Lower Left Selects if DC 5.0V from DC-Jack is "always on", or gets gated by 3.3V source from 20-pin connector ('auto'). If 'auto' mode selected and no 20-pin cable connected, this is equivalent to turning the main supply to the board on/off. Thus when using the board stand-alone S1 acts as a power switch for the board. S3 Choose 5.0V source to connect to victim board. Can be used to turn on/off 5.0V to victim board. S3-S7 Selected fixed LDO input source. Can be used to turn on/off certain LDOs. S8 Select adjustable LDO input source. Select 5.0V or 3.3V input (3.3V comes from ChipWhisperer). S2 Choose 3.3V source to connect to victim board. Select 3.3V from 20-pin ChipWhisperer cable, or local LDO. ChipWhisperer 20-pin connector (5.0V and 3.3V). Note you can use the DC-input power jack alongside the ChipWhisperer power supply. The CW308 can switch the DC-power on/off, allowing the ChipWhisperer to still control the target power. 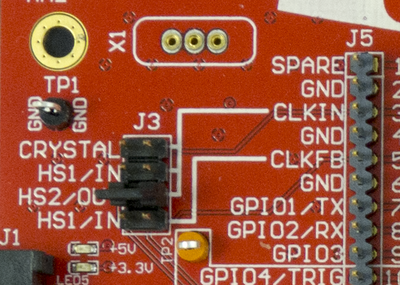 If using the board stand-alone, you can use the 3.3V pin of the CW20 pin to turn on/off the board remotely. This pin can be used as a digital input, which will turn on/off the 5.0V power jack. Be sure to switch all regulators to use the 5.0V DC-Jack in this case to avoid having a load on the 3.3V pin. There are five LDOs on-board the CW308. While they are mostly rated for 800mA, the board does not have sufficient thermal dissipation to operate at these conditions. Four of the LDOs have fixed voltage settings: 1.2V, 1.8V, 2.5V, and 3.3V. The fifth LDO is adjustable, and is especially useful if you need to either (a) overcome the voltage drop of a shunt, or (b) feed a power supply into a device to turn off an internal regulator. The CW308 contains a L-C low-pass filter. 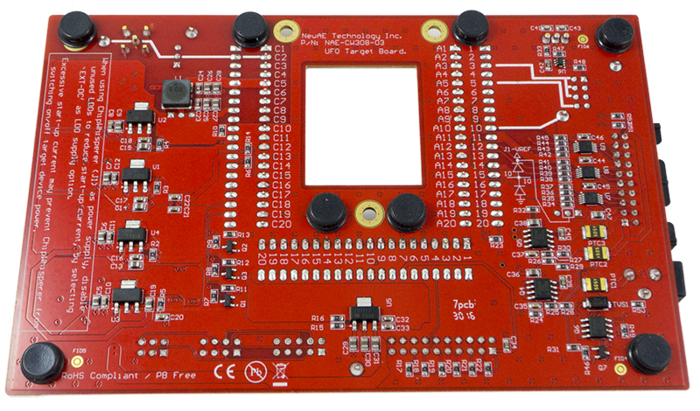 This filter is designed to provide a highly filtered version of the power supply to the victim board. The various voltages on the victim board power headers can be directly routed to the various required power pins. For example if your device has an on-board PLL, this power supply is something we do not need to measure as part of the power analysis. The "core" voltage supply for the device should first be fed through the on-board filter. This is accomplished by feeding the desired voltage (for example a 1.8V supply) into the "FILT" pin (pin C8). The output of the filter will be present on the FILT_LP and FILT_HP pins. You can then feed this through your shunt resistor, and finally to the core voltage of the device being measured. Note jumper J14 can be used to override the filter input voltage. This override can come from the adjustable regulator as previously mentioned. 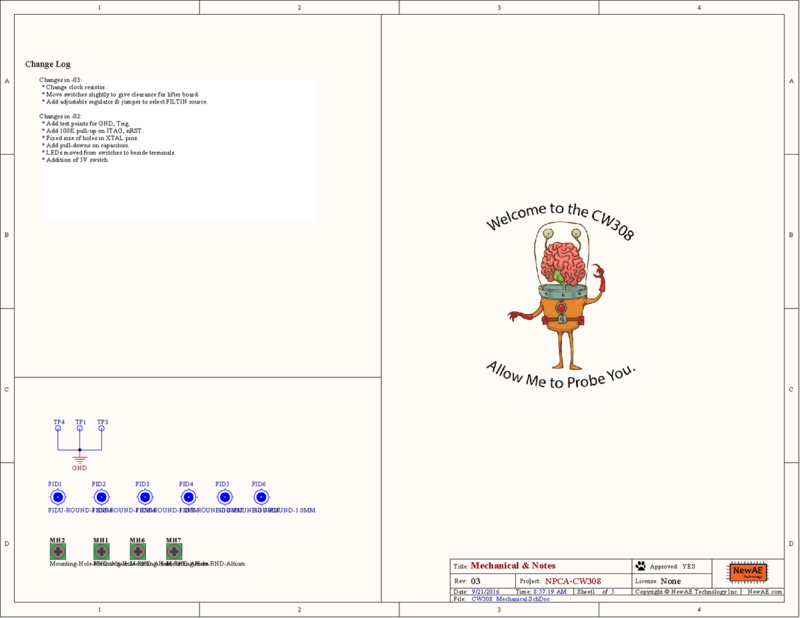 There are several headers that can be used as programming headers for the victim board. These are J10, J12, an J15. They are routed to pins 10 to 20 (H1 to H10) on the victim board connector J9. These connectors function is defined by the specific victim board mounted. 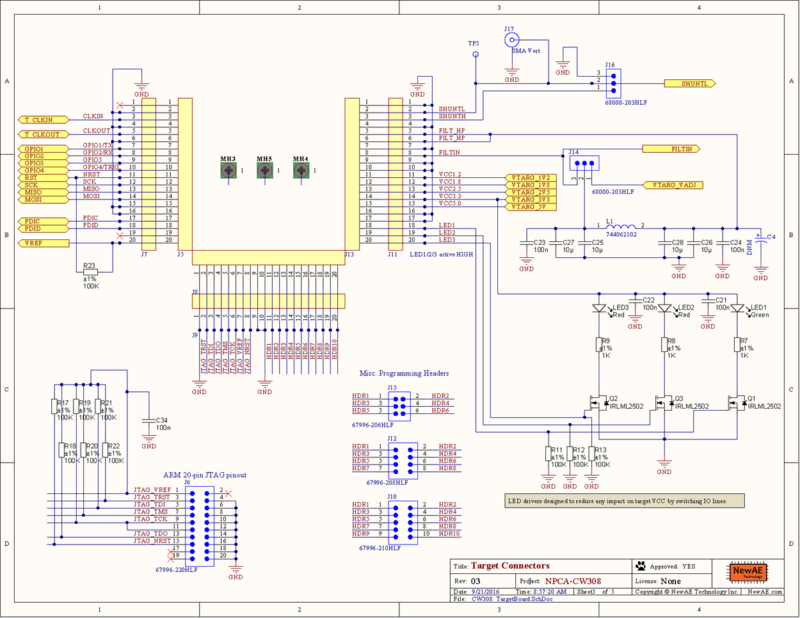 In addition there is a 20-pin JTAG header. This uses the standard JTAG ARM pinout. X X Connect crystal oscillator output to CLKIN on Victim. X X Also send clock to ChipWhisperer-Capture input for synchronization. X Route crystal oscillator to ChipWhisperer-Capture only (and not to target device). X X Route clock from ChipWhisperer-Capture to device (i.e., may be glitchy version of input clock). 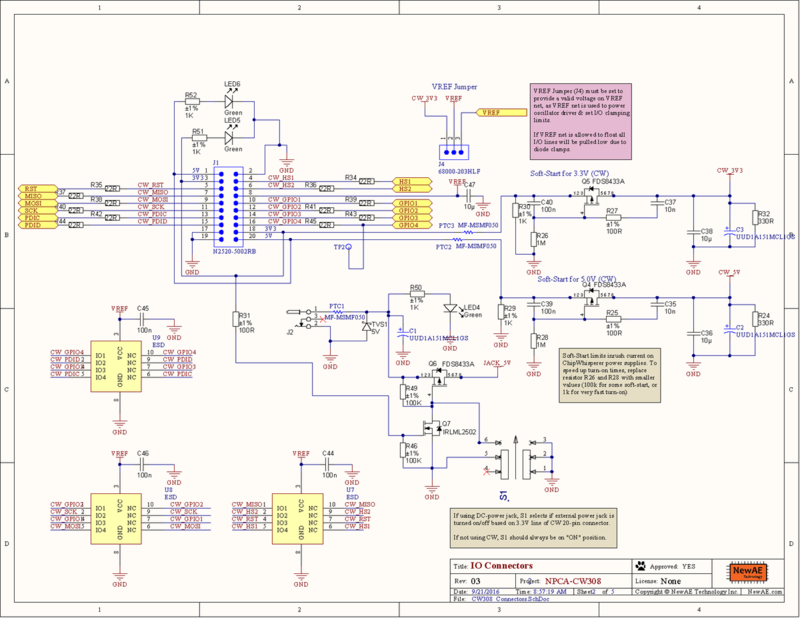 X X Route clock from victim to ChipWhisperer-Capture for synchronization. Selects levels for the diode clamps, selects voltage set on ChipWhisperer 20-pin connector VREF pin, selects I/O level for crystal oscillator. X X VREF Network set to 3.3V from ChipWhisperer 20-pin header. If using board stand-alone this option cannot be used. VREF voltage can be fed into center pin via a jumper wire. Selects source of FILT_IN pin. This pin can either come from the victim board (where victim sets own voltage), or the VADJ network (where adjustable regulator is used). The adjustable regulator is often required when overcoming the voltage drop in the shunt and/or filter. X X Filter input set by VADJ. Be sure to adjust voltage before using this. Filter voltage can be fed into center pin via a jumper wire. The CW308 can be used stand-alone. This is accomplished by providing an external DC power supply, and using a SMA-BNC to connect the voltage measurement to an oscilloscope. 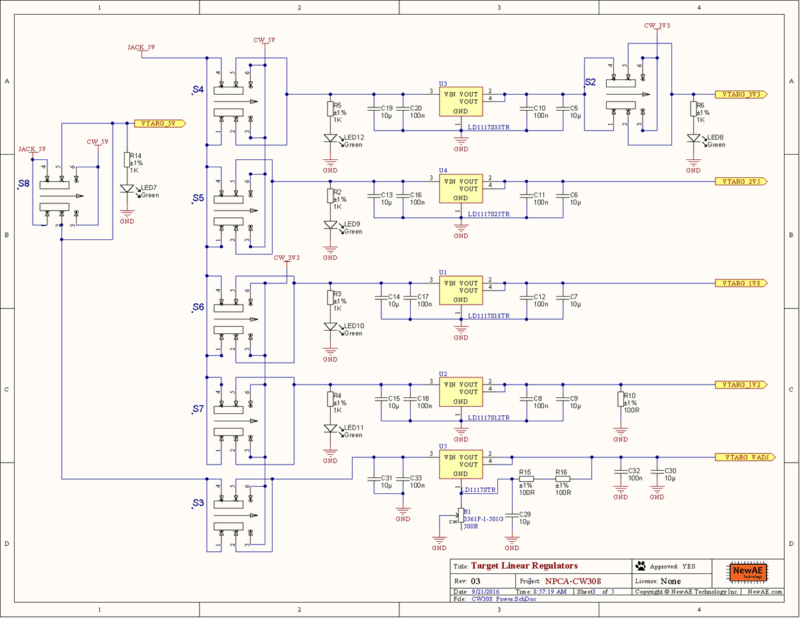 For more details, see CW308T: Stand-Alone Simple Serial Example (AVR or XMEGA). 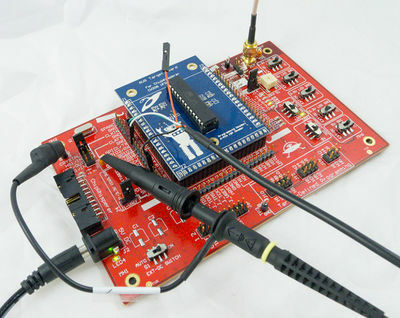 If using a simple-serial target (such as the XMEGA or AVR), you can connect a USB-Serial device to provide communication. 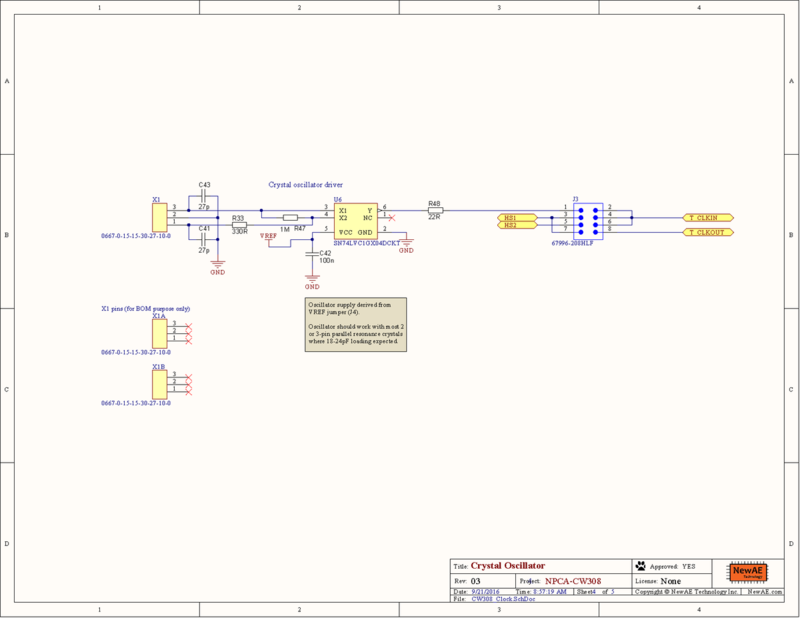 The schematic is available in PDF format here: NAE-CW308-03 Schematic (PDF). This page was last modified on 1 May 2018, at 11:16.